Poster for The Little Prince courtesy of Entertainment One. 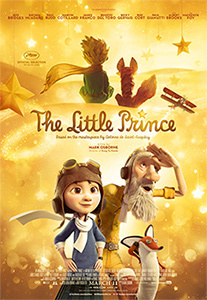 Based on the classic French novel Le Petit Prince by Antoine de Saint-Exupéry, in this first-ever animated feature film adaptation of the classic novel a little girl (Mackenzie Foy) lives in a very grown-up world with her mother (Rachel McAdams), who tries to make sure she is prepared for it. Her eccentric, kind‐hearted neighbor, The Aviator (Jeff Bridges), introduces the girl to an extraordinary world that he discovered long ago, where anything is possible. The world of The Little Prince (Riley Osborne). In the universe of The Little Prince, the little girl goes on a magical journey into her own imagination, where she rediscovers her childhood and learns that what matters most are human connections and the things that can only be seen with the heart.